June 21, 2017 December 10, 2017 - by Linda - 4 Comments. 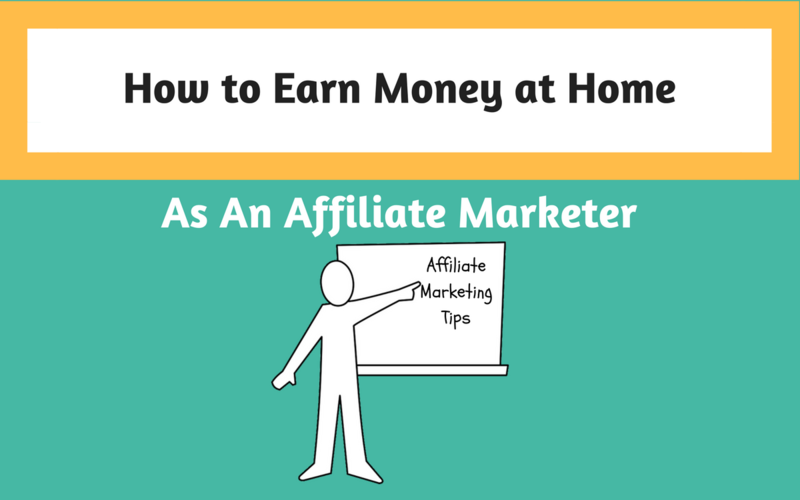 Would you like to learn how to earn money at home as an affiliate marketer? If so, you’re in the right place because that’s exactly what I do. I admit I encountered more than my fair share of people pitching get-rich-quick schemes before I found my way. After you’ve seen a few of these online scams, you get a little skeptical. You begin to ask, are there really any reputable ways to earn money on the Internet? Today, I want to assure you that there are! Let me help you avoid the landmines and start down the right path. Here are some affiliate marketing tips that will get you started on your journey. Affiliate marketing is a very simple concept. It involves promoting the products or services of others for a fee or commission. There are thousands of online vendors who have affiliate programs, so there is no lack of products to promote. Affiliating with more than one vendor is also not a problem because all legitimate affiliate programs are always free to join and the enrollment process is quick and easy. Vendors understand and appreciate the value of affiliate relationships in today’s Internet-based society. 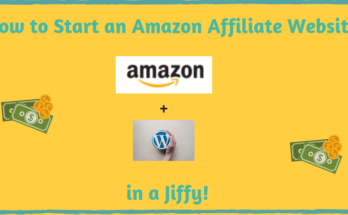 For more information on the process, see How to Become an Amazon Affiliate Marketer. Where Can I Learn How to Earn Money at Home as an Affiliate Marketer? 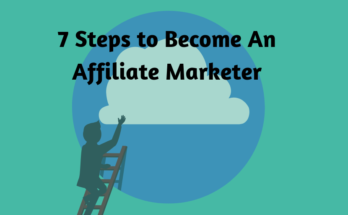 Getting started as an affiliate marketer is not at all difficult, and I can also show you how to get started for free. Let’s talk first about the basic requirements. Working from home as an affiliate marketer requires that you have your own website. Fortunately, creating a website is very easy with the tools available today. If you have a computer, an Internet connection, and can use email, you can use a website builder. I created the basic structure for my website in a matter of minutes with about four mouse clicks. If you find this surprising, please take a look at the video on my Build a Website page. The video walks you step-by-step through the creation process in real time. Again, if you have experience using email, you will be able to follow the steps with no problem.You will need hosting for your website, and I recommend some training because everything is easier with a clear blueprint. Here’s the basic premise that powers Affiliate Marketing. Connect people with the information they’re searching for and earn income for doing it! Pretty cool, right? I can highly recommend the online community that I joined, called Wealthy Affiliate. For more information on this organization, please see my detailed review of Wealthy Affiliate. a highly supportive global online community with thousands of active members who are willing to answer questions literally 24/7. You can get your start as an affiliate marketer, as I did, for free. Yes, you read that correctly. Wealthy Affiliate offers a 100% free Starter Membership. I could not pass up this opportunity because I had absolutely nothing to lose. The Starter Membership is not a trial that expires. It is an on-going membership level that you can continue at for as long as you choose. Your free Starter Membership includes 2 websites, hosting for the sites, and 10 lessons that will have you up and running online. You have every opportunity to fully explore the Wealthy Affiliate facilities, build your website, and try affiliate marketing to determine whether it is a good fit for you. I am a frugal retiree. I explored many other options for working online from home before stumbling upon Wealthy Affiliate. None of the earlier options worked for me because I was unwilling to invest any money upfront without knowing exactly what I was getting into or if I would enjoy the work. I’ve come to know and appreciate the value that comes with membership in WA because I had the chance, through my free membership, to make an informed decision. I have since become a premium member because additional training is available along with long-term, continuous support from the community. Create a website around a subject you are familiar with and for which you have an on-going passion. This will make writing content for your target audience much easier and far more enjoyable because you can relate to your readers (the members of your niche) on a core level. As a fellow enthusiast, you’re in a prime position to provide exceptionally helpful content to your followers because you have encountered the same issues and voiced many of the same questions. You have experience and insights to share which will set your site apart from others. Personal knowledge of your subject matter also allows for selection of products to promote that you feel completely comfortable recommending. Affiliate marketing is not a get-rich-quick scheme, and you will not see overnight success. But with patience and consistent effort, you can build a successful online business using proven techniques. Hundreds of thousands before you have successfully employed this technique with good reason. More than 3.5 billion people use the Internet every day, and it is open for business 24 hours a day, 365 days a year ensuring vast potential. It will take months, perhaps as long as a year to see results, but aren’t you worth it? And, we can’t discount the invaluable benefits beyond financial rewards! I’m sure you share my goal to remain vital, mentally alert, and relevant throughout my retirement years. Numerous studies confirm there is no better way to achieve that goal than challenging yourself to learn new things. As you invest time in building your business, the mental stimulation will banish all thoughts of boredom or stagnation. Give yourself the best chance of achieving success by getting access to outstanding training and resources. Wealthy Affiliate has made its mark in the online space by offering an all-inclusive platform to both newbie and successful Internet marketers. Here are some of the features Wealthy Affiliate offers that attract new affiliate marketers and retain successful members for years. I strongly advise everyone to take the free membership approach. You’ve most likely found my site because working from home is your long standing dream. I understand because it was my dream as well. Here’s your chance to vet the dream and see if the reality of working from home meets your expectations. That’s a rare opportunity indeed! 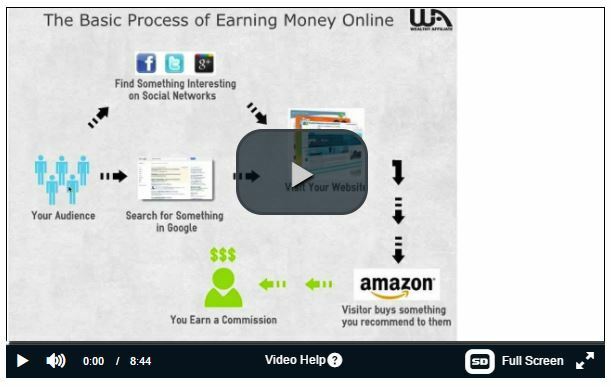 If you’re interested, here’s a sneak preview of a video that further explains the process of making money online. If (and only if) you decide that WA is a good fit for you, you can opt into premium membership down the road as I have. A premium membership is $49/month ($19 for the first month) or $359/year which is an excellent value in its own right. I hope you found my tips and affiliate marketing overview helpful. You too can learn how to earn money at home as an affiliate marketer, but you do have to take the first steps. Please be sociable and share this information with family and friends on your favorite social media platform! Most importantly, share your affiliate marketing experiences, and any remaining questions, in the comment section below. I will respond to every comment and welcome your input. Next Article What is the Difference Between a Domain and a Website? Love the site. The information is excellent. 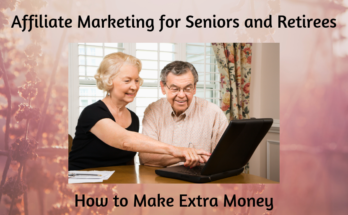 The baby boomers like myself are always looking for another way to supplement their retirement income. The different ways to monetize a site is very helpful. Wealthy Affiliate should be a great place to start. I liked the free website. Especially starting out with limited income. As a baby boomer myself, I feel strongly that we can all use good information about ways to supplement our retirement income. Wealthy Affiliate is indeed an outstanding place to start if you’re on a limited budget. Free is good 🙂 I appreciate your input and wish you well! As your article pointed out at the beginning indeed there are so many scam online opportunities that promise easy, quick money to naive people that it puts a bad light on the honest ones out there – such as Wealthy Affiliate. It was great to see that you promoted WA not only as to what is offered educationally through training, tools and the tremendous community support at the site; but you also provided instruction on just how a person would go about it the correct way as an affiliate marketer. I agree with you – unless a person has a passion for and great knowledge about a particular niche he/she should avoid it and not just think about the potential $$ involved. They would not have a successful business anyway just as long as visitors to their website could easily detect that the owner knew next to nothing about the niche. It does take a great deal of commitment to build up any online business. Unfortunately as so many people still get suckered in by the phony promises of the fraud opportunities, it just mean that those businesses will still rake in money based on the greed of the naive. Why people still fall for these scams is beyond my comprehension. Thanks for your great comments and insights into affiliate marketing. The shear volume of online scams out there tells you that people do indeed fall for them. My goal is to educate and increase awareness because working online from home can be such an excellent opportunity for many people and there are legitimate opportunities like Wealthy Affiliate. Yes, it requires commitment but it’s worth the effort.